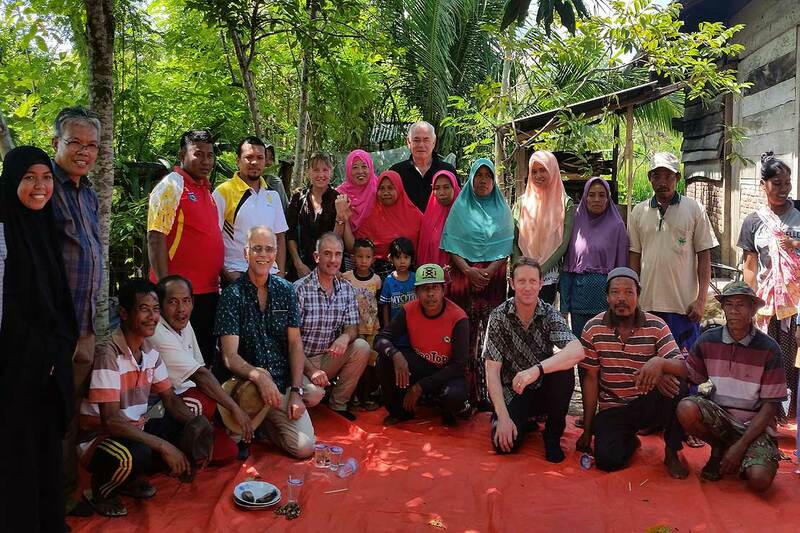 Professor Julian Heyes, Dr Janet Reid, Professor Steve Morriss, Mr Graham Robinson and Professor Chris Anderson with one of IFSCA's village cattle farmer groups on Sumbawa island. Massey University is helping farmers and educators in Indonesia to build a more sustainable and successful agriculture sector through an innovative aid programme. The East Indonesia Innovative Farm Systems and Capability in Agribusiness Activity (IFSCA) project, which is funded by the New Zealand Aid Programme, focuses on building human capability on farms and in classrooms through the University of Mataram in Indonesia, as well as infrastructure on the ground. A delegation of Massey University staff has been in Indonesia discussing the future of the project and the success of the collaboration to date. The project has seen the installation of important infrastructure, with structures such as cattle feeding units already built on the island Sumbawa. This visit saw Massey’s Assistant Vice-Chancellor Operations, International and University Registrar Stuart Morriss and the Bupati (mayor) of North Lombok District Dr Najmul Akhyar lay the foundation stones for a village-level grading shed for fresh fruit and vegetables. This will assist villagers to supply high-quality fresh fruit and vegetables to high-end hotels on Lombok’s tourism coast, including lettuce, capsicum, tomatoes, chilli, cucumbers and basil. Through the IFSCA programme, farmers in North Lombok are being trained in both horticultural production and agribusiness skills. The relationship between the universities has led to postgraduate students for Massey, joint publications and the current programme, which matches expertise between the two universities in agriculture, extension, animal science and food technology. Massey’s Professor Chris Anderson says the programme has been gaining momentum each year. “It has been great to get the people working on both sides of this project together as they mostly work thousands of kilometres apart. The collaboration between universities and farmers has exceeded our wildest dreams and we are starting to see real changes that will benefit everyone involved,” he said. A key sustainability target of the programme is to build capability within the agricultural extension system operating in North Lombok. This work is led by the College of Sciences’ Dr Janet Reid. Professor Julian Heyes is leading the horticultural technical programme and Professor Steve Morris is leading the animal science technical programme, with Mr Graham Robinson of the Massey Projects Office providing project management support to the team. While in Indonesia this week, Mr Morriss chaired the fourth advisory board meeting for the project, which reflected on achievements and lessons learned over the past 12 months, and reviewed immediate and longer-term plans. The project is part of larger university effort known as Massey University Worldwide that aims to develop the international education market as a major export earner for New Zealand and expand Massey teaching and research activity internationally. It works within agriculture, humanities and social sciences, aviation, business, emergency management, environment, health and veterinary medicine.